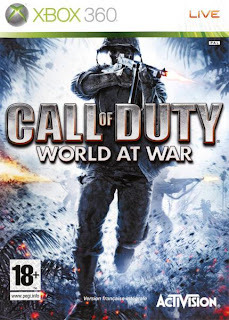 Released in the Fall of 2008, Call of Duty: World at War saw the series return to its World War II roots. The game was developed by Treyarch Studios and utilized the same engine borrowed from Infinity Ward who did Call of Duty 4: Modern Warfare. I love World War II shooters so it was easy to enjoy COD: WAW. But I feel like the single player campaign in this game lacked the same punch felt in COD4: MW. None of the missions seemed to have the same degree of ruggedness and urgency. And because of this, the campaign did not seem as memorable. The campaign pits you off in two different scenarios. On one side you'll play as Private Miller, part of the American Marine Corps, against the Japanese army in the Pacific, while on the other side, you play as a Russian soldier named Demetri who aids the Red Army against the Nazi invasion. In keeping with the consistency of history, there's no real last boss or central figure that you're up against rather just the armies themselves (I guess they don't want you killing Hitler a la Inglorious Basterds). After playing MW a few months earlier, the lack of a main antagonist was really felt and I tihnk detracted from my experience. Couple that with a short campaign (it took me about 8-9 hours) and it almost feels like a failure. But what redeems them is their multiplayer modes. The multiplayer aspects of the game are what I did enjoy the most. I love cooperative gameplay and WAW really delivered in this regard. The game gives you a few options in doing the campaign missions. You can either conquer them by yourself, with friends cooperatively, or with friends competitively by competing for the most kills and highest scores. Tackling down the missions with a group of four players makes even the toughest missions seem like cakewalk and is really fun as you try to one up each other in scoring. 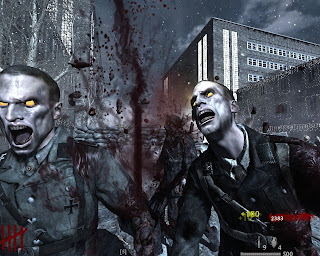 Probably my favourite mode of all, trumping the single player campaign, is the Nazi zombie survival mode. Together with up to three team mates, your team is locked off into a small area where you have to fend off increasing waves of Nazi zombies. You start off with only a pistol, but you gain points as you kill more zombies allowing you to purchase new weapons from the walls or even random weapons from a magic chest. This is the funnest mode in the game and easily could have been a successful standalone game if they fleshed it out with more maps. I haven't played much of the competitive multiplayer modes, but from what little I did, it seemed as though the same system used in MW was used in this (eg. kill people, gain points to gain ranks, unlock weapons and perks). I had fun with the game, but I admit that that if it were not for the Nazi zombie mode, that it wouldn't have been particularly memorable. And now that I've picked up Modern Warfare 2, I have almost little reason to return to this game unfortunately. That's about it for today, later geeks! I actually downloaded the iPhone version (lite, mind you: I'm not shelling over ten bucks :D)- and it's a faithful reproduction. even with the unlockable door, and clear-able debris. Awesome! Yah, I heard the iPhone one is pretty fun! Wow Jeff, you're racking up quite the collection of games :). Keep in mind SC2 is still in the horizon!